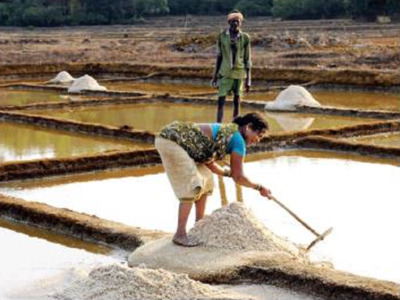 There is no single salt pan plot in Mumbai which is 1,000 acres. This opens up the possibility of allowing development on salt pans in the city since the Centre says that only contiguous land over 1,000 acres can be now defined as wetland, say government sources. The issue was discussed during a meeting held by the state’s chief secretary soon after the directive for a new survey of salt pans came from the Union environment ministry. “MMRDA has started the survey,” said a senior official. 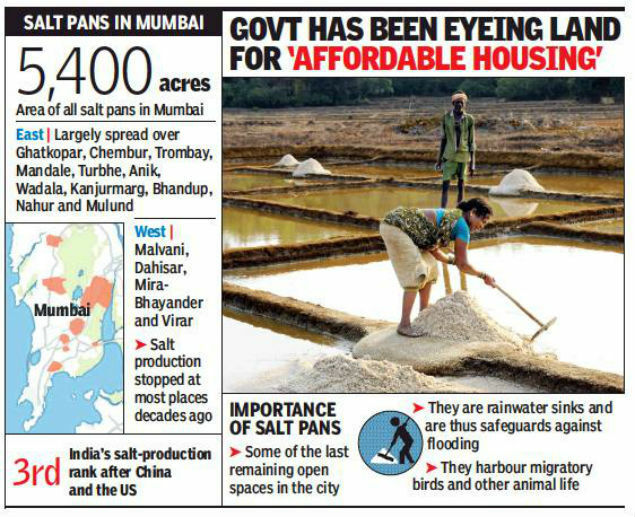 Three years ago, chief minister Devendra Fadnavis had announced that 600 acres of Mumbai’s salt pans could be used to build affordable homes. In 2016, MMRDAsurveyed all salt pan parcels and established that barely 25 acres of such land—a negligible 0.5%—is developable. Worse, these pockets are not contiguous, but are in bits and pieces in different locations of the eastern suburbs. The survey found that large swathes of salt pans cannot be built upon as they are wetland or covered with mangroves. Some expanses are encroached by slums and buildings while other plots are under litigation and title disputes. After the report was submitted, a senior government official had told TOI that there could be no scope to prepare a master plan for housing on salt pan land. “The Centre will have to change the rules to allow construction,” he had said. Coastal Regulation Zone (CRZ) norms ban construction near wetland and mangroves. Environmentalists say notwithstanding the environment ministry’s move to open up salt pans for development, these sprawls are still protected under the existing laws. Debi Goenka of the Conservation Action trust said all salt pans fall under CRZ and the Wetland Rules of 2017 exclude all areas that fall under CRZ. “Salt pans are still categorized as CRZ 1 as per the 2011 CRZ notification. Since salt pans fall within the high tide line and low tide line, there is no question of any building proposal being permitted in these areas,” he said. The sprawling salt pans act as a natural buffer along Mumbai’s coastline and are part of a contiguous ecosystem that includes estuaries, wetlands and mangroves. They are free of human habitation and afford the last few tracts of open space and clean air available around the city. Private salt works and land were in existence prior to the advent of the Portuguese and Marathas in the former Bombay and Salsette islands. They existed in Thane, Panvel, Uran, Trombay and Chembur.